The pressure of a given force decreases as the surface area increases. The pressure of a given force increases as the surface area decreases. A sharp knife has a very small surface area on its cutting edge so that high pressure can be exerted to cut the meat. The studs on a football boot have only a small area of contact with the ground. The pressure under the studs is high enough for them to sink into the ground, which gives extra grip. Nails, needles and pins have very sharp ends with very small surface areas. When a force is applied to the head of a nail, the pressure will drive its sharp end into a piece of wood easily. Skis have a large area to reduce the pressure on the snow so that they do not sink in too far. A tractor moving on soft ground has wide tires to reduce the pressure on the ground so that they will not sink into the ground. A wide shoulder pad of a heavy bag will reduce the pressure exerted on the shoulder of the person carrying the bag. A liquid in a container exerts pressure because of its weight. The pressure at any point in a liquid, at a particular depth, acts equally in all directions. The pressure in a liquid does not depend on the area of its surface. The pressure in a liquid acts equally in all directions and does not depend on the shape of the container. Relate depth to pressure in a liquid . The pressure in a liquid is directly proportional to the depth. The pressure in a liquid increases with depth. The pressure in a liquid is directly proportional to the density of the liquid. 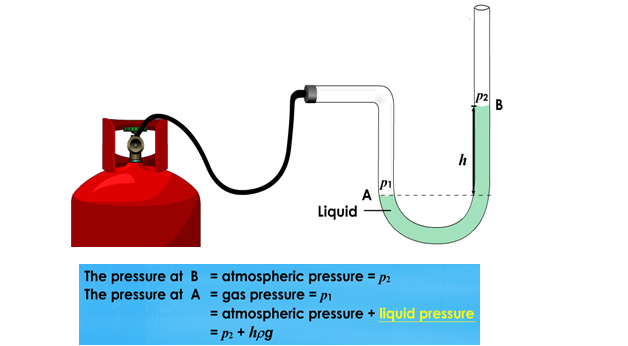 Formula for the pressure in a liquid. The wall of a dam is much thicker at the bottom than at the top because it must withstand the increased lateral pressure in depths of the water. Normally a water tank is placed at higher level so as to supply water at greater pressure. Submarine is built with thick wall so as to withstand enormous pressure at greater depth. A patient receiving intravenous drips of a certain fluid from a bottle. In order for the fluid to flow into the vein, the bottle must be placed at a height above the injection site. The liquid solution is at a higher pressure so it has sufficient pressure to flow into the veins of the patient. 1. If the density of sea water is 1150 kgm-3, calculate the pressure below 40m of sea water due to the water alone. 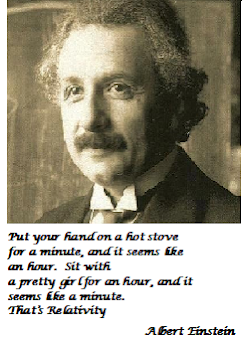 (Pressure in liquid = ρgh). 2. The figure shows a cylinder containing liquid mercury. What is the pressure caused by the liquid mercury at the point P? is the force per unit area exerted by the gas molecules as they collide with the walls of their container. is the pressure caused by the weight of the air above us. acts equally in all directions. varies with the height of the object above sea level. decreases with the altitude or the height above sea level. Atmospheric pressure acts under the surface of the cardboard is greater than the weight of the water in the glass. Pressure inside the metal can decrease. The atmospheric pressure outside the metal can is higher. Hence it compresses the metal can. the air pressure in the straw is lowered. the atmospheric pressure acting on the surface of the drink pushes the water up the straw and into our mouth. The air behind it is squeezed out. The atmospheric pressure outside the rubber sucker held it in position. Reduces the atmospheric pressure inside the cylinder. Atmospheric pressure on the liquid surface then pushes the liquid up into the syringe. atmospheric pressure outside pushes air up the cleaner hose ,carrying dust and dirt with it. 1. The mercury column rises or falls according to the pressure of air on the mercury in the dish. 2. The space above the mercury column is vacuum so it exerts no pressure on the top of the mercury column. 3. If the vertical height of the mercury is h cm, the atmospheric pressure reading is “ h cm mercury ”. 5. The height, h will increases when the barometer is slowly submerged in water. 1. Is used as an altimeter by mountaineers or in an aero plane to determine its altitude. a) decreases , the container will expand. 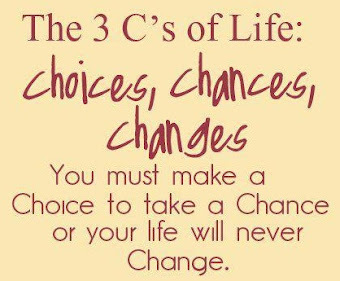 b) increases, the container will constrict. 3. The slight movement of the container is magnified by a lever system which is connected to a pointer. 1. When the gas supply is connected, the pressure in the gas acts to straighten the curved metallic tube. 2. The movement is transferred to the lever system which actuates a pointer to move across the scale. 3. Suitable for measuring higher pressure. Pascal’s Principle states that when pressure is applied to an enclosed fluid, the pressure will be transmitted equally throughout the whole enclosed fluid. When the piston is pushed into the glass sphere the jet of water is shot out from the holes in the glass sphere with the same speed. This is because the pressure acting on the water is transferred uniformly throughout the water. A small input force, F1 is applied to the small piston resulting in a large output force, F2. A hydraulic system must not contain any air bubbles in any position of its hydraulic fluid system. This will reduce the efficiency of the system as part of the applied force will be used up to compress the air bubbles. By moving the push-pull handle a number of times , the large piston can be raised carrying a heavy load. A small force acting at the pedal can transmit a large force to all wheels simultaneously to stop the car. object is equal to the weight of fluid displaced by the object. (a) The actual weight which acts downwards. 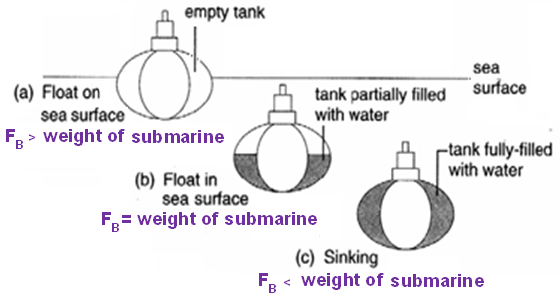 (b) The buoyant force which acts upwards. The object displaces a volume of liquid. = volume of the submerged part of the object. A ship float in sea water. Although a ship has a larger density than water, its shape is hollow so that the overall density of the ship is smaller than the sea water. Boat made of steel will float in water, but a block of steel will sink. The volume of water displaced by the ship is sufficiently large. The weight of water displaced is large so the buoyant force acting on the ship is also greater. Therefore it float. The buoyant forces in the sea and in the river are the same because the buoyant force is equal to the weight of the boat. The density of fresh water is lower than sea water. The lower the density of the water, the larger the volume of water displaced. Therefore the boat float lower in the river compare to the sea. The purpose of Plimsoll line mark on a ship. Plimsoll line marked on the body of the ship acts as a guide, to ensure that a ship is loaded within safe limits. Used to measure the relative density of liquids in accumulators, such as milk or acid. It consists of a tube with a bulb at one end. Lead shots are placed in the bulb to weigh it down and enable the hydrometer floats vertically in the liquid. In a liquid of lesser density, a larger volume of liquid must be displaced to equal the weight. The hydrometer is submerged more. 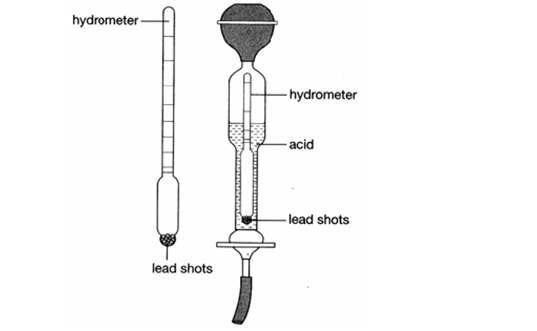 In a liquid of higher density, the hydrometer floats higher. A hot-air balloon displaces a large volume of air. buoyant force < the total weight of the balloon: the balloon will rise. 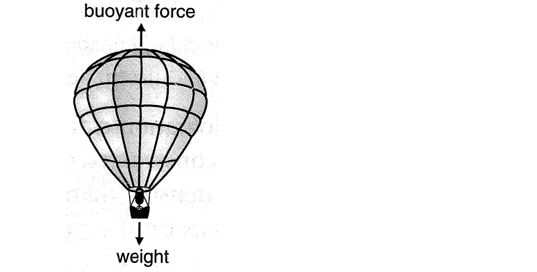 buoyant force = the total weight of the balloon: the balloon floating in the air. - the paper moves up. - because the air moved at a very high velocity. - the pressure of the moving air decreases as the speed of the air increases. - the two ping-pong balls will move closely to each other. - the air moved at a very high velocity between the balls. 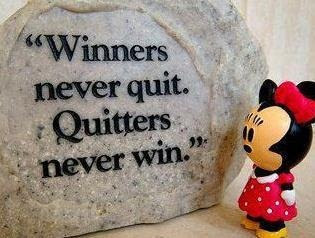 - the ball is not falling down. hold the ball from falling down. - the speed of air is greater on the upper surface. - the pressure of the moving air is lower. because of the slower airflow. The tube has different diameters at different positions. 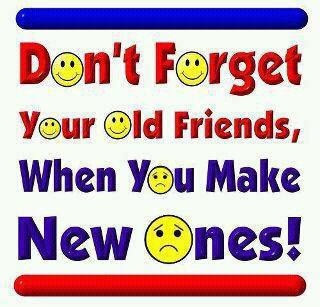 sorry.. but do u hv a bahasa version?